Contrary to its programmatic critique of representational manifestations of the aesthetic, performance art has been canonized as an art form through documentary material and recorded images. Event scores, performance protocols, gallery leaflets, witnesses’ accounts, artists’ anecdotes, drawings, photographs, slides, audiotapes, video recordings, and films are some of the media and materials, which support the representation, critical perception, and theoretical reevaluation of particular performance works over time. At the crossing points of art history and performance studies an extensive debate has evolved around the question as to how performance art practices challenge and transform contemporary art historiography. For the past decade, scholars’ critical responses to performance works have explored the ways in which engaging with the limited accounts and inconsistent tangible forms of documentation allow for new practices and methodologies of historicizing live art. With shifting emphases the discussion about performance art’s tradition and histories has covered the various modes of assessing historical records as materials for scholarly work, the time-based technological and embodied modes of transmission, the contested place of live art in an artifact-oriented archival culture, the wide range of contemporary artistic modes of production, which appropriate from past performance work, and the curatorial practices, which relocate and rearrange documents and artists’ self-documentations in exhibition spaces, in printed catalogs, for online streaming events, or in digital collections. In the following, I want to address in detail documenting practices that use the time-based medium of film to engage with performance art’s negotiation of embodied relations, duration, and disappearance. More specifically, I wish to discuss the artistic practices of documenting performance art on film as aesthetic interventions that accomplish a transition from embodied acts and choreographic spaces to the audiovisual time-space generated by the images’ developmental forms. My approach presupposes a distinctive understanding of performance art and moving-image work as a constellation of concurrent temporal arts, which are specific in their differential negotiation of liveness, recurrence, and (theatrical) reproducibility. Taking the example of Being and Doing, an experimental documentation of live art practices by Stuart Brisley and Ken McMullen from 1984, I shall explore the ways in which the heightened iconic characteristics of performance works — when they are captured on film and displayed as sequences of framed shots — introduce new relations between the physicality of the event, material configurations in time, and durations of embodied acts. First, I shall look more closely at Brisley’s understanding of the transformative capacity of documentation, which is most vividly demonstrated in his own performance practice. Commenting on his collaboration with photographer Leslie Haslam in conceiving, performing, and documenting his durational performance piece Moments of Decision/ Indecision in 1975, I seek to elucidate Brisley’s distinct interpretation of performance and photography as different time-bound aesthetic practices. Next, my analysis of three sequences from Brisley’s and McMullen’s film Being und Doing describes the ways in which the captured live art works are recomposed by filmic techniques such as framing and by the material procedures of printing and montage. Finally, I characterize the exploratory film aesthetics of Being und Doing as a continuation of the tradition of structural materialist filmmaking and its interrogation of the physical and perceptual particulars of the film medium. Briefly, my discussion of Being and Doing elaborates the film’s inventive aesthetics as a conjunction of body art practices and a process-oriented mode of documentation, which is concerned with the frame as the essential constituent of film form. The black-and-white photograph shows a man. He is naked. He is squatting on the floor, turning his back on the camera. His left knee and the toes of his left foot rest on the floor. His right leg is bent, his right foot stands on the floor — as though the body might move ahead at any moment, as though the man might perhaps put his left foot on the floor and straighten up. The kneeling, reposing body’s back is covered in white paint, which ends in some streaks on the buttocks. Given the smooth, consistently covering layer of paint on the bent back, the figure stands out distinctly against the rough surfaces of the surroundings; that is, the paint, spilled, squirted out, in the empty room, black and white. The photograph’s composition is in striking disorder. The body is off center, shifted upwards. As a result of this, the body’s position seems unbalanced with regard to the proportions of the upright photograph. The body appears to be captured in its move away from the camera — as if the photograph has caught the body in the upper half of the image field just in time. The figure’s shoulders and its right arm come very close to touching the frame of the picture. The body’s orientation in space and its anticipated passage through space go beyond the frame, which is set up by the photograph. Warsaw, photograph by Leslie Haslam. In 1975 Brisley’s durational performance Moments of Decision/Indecision took place in a studio in Warsaw, as did Haslam’s act of taking the photograph — that is, his act of sharing the space and his gesture of releasing the shutter for a brief moment in time. The photograph offers a stilled view of the performer’s action. A “photographic act” registered the physical activity that was carried out in front of an audience and in front of the camera. The action is kept in place and held through time as a picture. 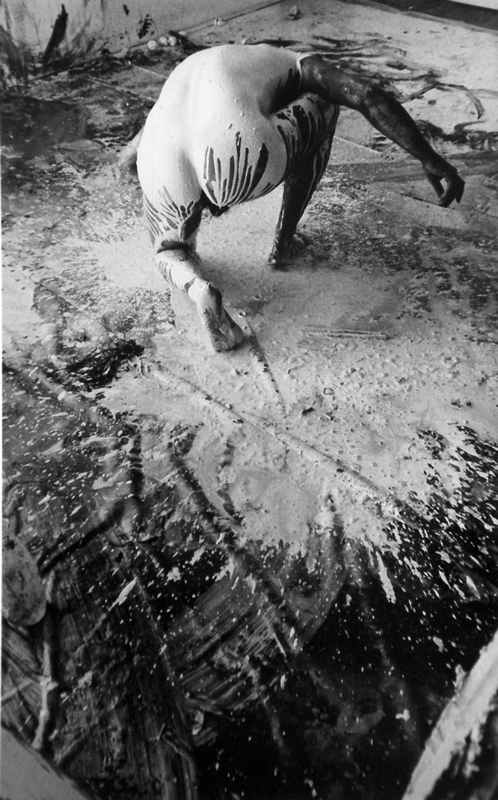 The photograph’s static view takes beholders back there, to a place and a particular point in time, to a performer and a photographer, to white and black paint and black-and-white negative film, to a choreography of the performer’s and the photographer’s simultaneous, interrelated movements, working in time and reworking time. Drawing on the reproduced photograph at hand, contemporary beholders can imaginatively recreate the scene of the image’s making. By means of its material marks and references to objects the photograph enables beholders to go back to the past circumstances and the past effectiveness of the movements in the real space of the performance event. The photograph generates an unchanging, momentary depiction of relationships that were not yet set at the moment of taking the photograph in the performance situation. The photograph fixes one particular moment out of the once present and mutable arrangement of bodies and materials, which was in an ongoing transformation for the duration of five days. The title of Brisley’s performance work points out these complementary aesthetic practices, which move forward by foregrounding either a series of breaks or sheer duration: Moments of Decision/Indecision. The photograph shows the configuration — the juxtaposition and concurrence — of two time-bound creative practices, which are specific in the ways in which they reorganize time. On the one hand, there is the duration of the real, physical execution in the “here and now” of the performance. On the other, there is the brief moment of photography’s discrete intervention. As practices, which shape forms, performance and photography set up particular arrangements of movement, standstill, and change. In general, performance as an art form is characterized as a space- and time-bound, limited, linear sequence, which evolves, consumes time, and comes to an end in the presence of an audience. By contrast, photography manufactures a simultaneous view of particular objects on a flat surface. Due to the photo-chemical process — that is, the sequential order of taking the photograph, developing the negative film, exposure and fixing the picture on the image carrier — photography’s representation is always displaced in space and delayed in time in relation to the represented objects. Beholders encounter a photograph as a belated, transported, and traveling picture, which is multiplied, brought into circulation, and dispersed. A photograph enables beholders to decide on the duration of their act of taking in the picture and allows repeated viewings. Brisley’s description transcends the dichotomy of the transient and the immutable. Apparently, Brisley does not view the tendencies of dematerialization, process-orientation, and disappearance, which have been attributed to performance art, as an abrupt break with traditional manifestations of an artwork. Rather, Brisley’s consideration of the “the question of the relative durations of the impermanent” allows for exploring the particulars of performance as a temporal art in relation to — and in contrast to — other art forms. He puts forward the idea that performance events as well as images, objects, and recordings are time-based forms. They exist and end in time, their experience takes time, and their interpretation as well as their (institutional or curatorial) contexts change through time. With regard to the practice of performance art the production and passing of the work in the presence of artist and viewers has been widely discussed as the distinctly fleeting qualities of live work. Brisley’s observation, however, suggests an alternative aesthetics of time. Here, the question of liveness is tied to the question of arts’ materials and the particular (history of) material practices in different mediums of art. I think of this approach as a way to postulate the close linkage of material practices and temporal acts in the creation of live work. The process-like nature of performance art can be described as essentially dependent on materializations and specific dynamics of shaping and shifting forms. It is precisely because spectators perceive this dynamic of making and remaking material arrangements in space that various and contradictory experiences of time — as alteration, passing, or duration — become possible. In brief, Brisley’s remarks suggest an inquiry, which moves on by “rematerializing” the experience of time in the performance situation and by temporalizing artworks’ material forms. This mode of investigation recognizes the ongoing change of live artwork and artifacts of documentation. For Brisley the transition from a performance event to a photograph extends duration (Brisley 2007, p. 83). He understands the act of transcribing the event as transformative. The process of recording creates a particular interpretation of the performance work and brings about a new tangible form, which can activate new associations and frameworks of reference. Thus, the thoroughgoing modification of form separates the afterlife of the documentation from the documented event. In the text, where he raises “the question of the relative durations of the impermanent,” Brisley only refers to the still images of photography. His proposal to think every artwork in its duration and disappearance, however, is pivotal for the medium of film and its uses for documenting performance art, too. If we start from the temporalized existence of the artwork and from the viewers’ heightened awareness of time as duration and alteration, then performance events and film documentations share the condition of a temporary and delimited visibility. A closer look at Brisley’s and McMullen’s film Being and Doing can help to elucidate the viewers’ contradictory experiences of a time past and passing, which evolves from particular uses of film as material and medium for documenting. So, how can we describe moving images as compositional and developmental temporal forms? What takes shape when performance practice challenges the operations of recording technology and introduces new relations between the time-space of the images’ shooting and the time-space of the projection event? And how do the images’ layered temporalities and their enactment of sensory object relations arrange the viewers’ volatile encounter with time? Being and Doing is a 55-minute film that was produced by the Arts Council of Great Britain (now Arts Council England) and broadcast on television in 1984. Subsequently, the film was occasionally screened at performance festivals or academic symposiums. Being and Doing was shot on 16 mm and comprises footage of communal rituals and artists’ performances, which had been collected by different camera teams between 1979 and 1983. Based on their understanding of a close connection between folk art and performance art, Brisley and McMullen explore socially and politically engaged art practices in Hungary, Yugoslavia, Scotland, Poland, Czechoslovakia, England, and Northern Ireland. The film’s intensely concentrated and rhythmically elaborate montage assembles photographs, sound recordings, and footage of communal gatherings and artists’ performances with a voice-over narration by Brisley. Being and Doing starts with a black screen. On the soundtrack a repetitive march rhythm sets in and we hear a male voice repeatedly shouting the question “Was ist Kunst?” (What Is Art?). The loud and harsh percussion rhythm is then doubled by the disconnecting cuts between a series of still images. Instead of presenting images of movement and changes in time, the montage of still images invokes the mechanical transport of the filmstrip in the projector — the disruptive motion from one immobile frame to the next. The impression of the montage’s mechanical beat is reinforced by the clacking sound of a slide projector, which occasionally accompanies the cuts between the images. The film’s beginning first presents a still photograph, which shows a group of military personnel and trucks in a city street. Next, the film’s title fades in and out, followed by credits, which give the names of the filmmakers. After that, a blurry black and white photograph becomes visible, which depicts evocatively a moment from a performance by Hungarian artist Tibor Hajas. This photograph is followed by a second, slightly different view of the crowd of military men in the streets and a further photograph of Hajas’s performance, which shows a different point in time and an altered bodily posture from his material-based action. A photograph follows, which depicts a large group of people, who are waiting in line in the snow in a nondescript street, somewhere. With a loud clack a long take begins, which displays in black and white a young woman in a studio space. This sequence continuously registers the woman’s slight movements and thus overtly demonstrates the images to be filmic images, which capture and display changes over time. A medium long shot presents the woman sitting on a stool in an otherwise empty room. After a quick zoom-in her face is shown in close proximity, which allows her mimic reactions to be seen. Within the continuous take from a static camera position the black and white images of the woman gradually shift to the bright hues of a shot in color. Thus, the successive images slowly build up a stark contrast between the colors of the woman’s face, hair, and red blouse and the white wall in the background. The sound of the male voice’s discomforting shouts persists throughout the entire first sequence. Finally, the audible events are synchronized with the images of the visible studio space, which is the original locale of the film’s sound recording. At the end of the scene, Brisley’s voice-over briefly describes the arrangement of Raša Todosijević’s performance Was ist Kunst? Todosijević is off-screen and directs his aggressive question repeatedly to a passive listener on screen. Brisley’s explanation clarifies the invisible origin of the sound and its connection to the visible space for the film’s viewers. The isolating arrangement of vision and hearing, of action and reaction in Todosijević’s performance piece is like an allegory of the film’s assemblages and collisions of images and sounds. The first sequence of Being and Doing presents isolated moments, disconnected places, and disorienting gaps between seeing and hearing. Viewers see uniformed and naked bodies, interior and exterior spaces, the title graphic’s flat surface, and views with spatial depth. The images show intimate spaces of artistic production and public places of political conflict. We see photographs in grainy black and white and photographs in faded colors. We see framed views and we hear beats and voices stemming from an invisible off-screen space. For contemporary viewers the photographs’ origins and the captured events are uncertain. Later in the film the photographs of military in the street are synchronized with personal accounts of the situation in Poland after martial law was declared in 1981. Thus, the viewers can assign specific meanings to the visual documents only in retrospect through their acts of recollecting and reconnecting the images. At the beginning of the film Brisley’s narration emphasizes the exploration of “risks” and the search for senses of community as the common ground for performance practices in Eastern and Western Europe. In the following, however, artists’ statements, witnesses’ accounts of public performances, and quotes from the censor’s defamatory declarations explicitly give voice to the political circumstances, which restrict creative practices. Furthermore, the text documents and recorded voices testify to the enforced invisibility of performance works in Hungary, Czechoslovakia, and Poland. On the one hand, the film produces evidence of performances by artists, which were hindered from publicly presenting their work — for example, by showing photographs of works by Tibor Hajas or by capturing a reconstruction of Jerzy Bereś’s performance Msza polityczna (1980), which was performed by Bereś in a private location for the recording camera. Thus, the film testifies to clandestine performance work and preserves art events for future audiences or for spectators in other places. On the other hand, the film’s montage introduces new relationships between performance works from different places and underlines connections and contrasts between the respective creative practices. Hence, the recording and rearrangement of images and sounds allow viewers of the film to revisit the different approaches to live art in the relocated time-space of the moving images. Being and Doing does not include images of Warpechowski’s performance. As viewers we only hear about the performance event by a witness, who remembers the compelling and unbearable scene of wounding and reveals his painful reactions in watching and reimagining the embodied act. For the film’s viewers’ the voice-over vividly evokes the bygone performance. The witness’s account elicits visions of an intense physical action, which inseparably merges with his particular experience of the performance event — that is, the shattered perception and recollection that testifies to a highly charged act of viewing. After the witness’s account has ended, the sounds of the visually presented performance Approaches to Learning are increased in volume. We see one performer slowly circling around the second performer, who is standing in the background with his back to the camera. Abruptly, the first performer hits the second performer on his right ear from behind. The blow causes the figure to fall down in the center of the frame. A quick zoom-in singles out the second performer lying on the floor. This montage sequence entangles two different performance events, which evolve in parallel on the film’s soundtrack and image track. As viewers we hear a personal memory of a bygone performance in the past tense, while physical activities recorded in another space and at another point in time are unfolding before our eyes. Nevertheless, we cannot avoid noticing correspondences between the sudden violent physical acts, which interrupt the continuity of both performances. The explicit audiovisual rendering of the blow unexpectedly changes the relationship between the film’s images and the viewers. As viewers we might feel a slight shock or repulsion and we suddenly become aware of our sensory perceptions and our affective involvement in viewing the film. Here, the montage might be best described as temporal layering and a conjunction of distinct spaces and activities. The asynchronous concurrence of image and sound connects the public performance of Warpechoswki with the intimate space in front of the camera, which provides the stage for Brisley’s and Robertson’s activity. The juxtaposition of the remembered performance and the present visible action articulates common concerns in the performances’ examination of the embodied relations between performers and viewers. For the production of Being and Doing most of the artists’ performances were carried out in front of the camera without live audiences. Accordingly, there is no on-screen audience, whose reactions might interfere or mediate between the captured performance actions and the film’s viewers. The footage of particular live art works presents the artists’ acts in a succession of frontal views. The camera never enters the space of the performance action. This mode of covering bodily movements from fixed, somehow removed positions does not create an illusionist representation of a unified and self-contained space. Rather, the succession of framed views and the length of single takes strongly evoke the real time and space of filming. Sometimes, the long takes’ continuous display of gradual movement slows down the visible changes that occur in the images. The images then register the duration of embodied acts and movements through space in real time. By means of long takes from static camera positions and by means of an unsteady handheld camera, the camera becomes recognizable as a physical object that is positioned in space and tied to a place. Accordingly, the perceivable gestures of filming demonstrate that the frame is a structuring operation — a limited view on space that shapes a form. Fifteen minutes into the film a performance by Warpechowski is presented in black and white images with a slight blue tone. A medium shot presents Warpechowski’s preparation for a performance and a person who is helping him. The performer wears only white briefs and has some cables wound around his body. After a quick zoom-out, the following shot discloses a white spacious room, which looks like a gallery or an artist’s studio. In the background some sheets of paper hang on the wall. Further, we see some tripods in the background and a small camera crew, who are apparently recording an interview with a man. In a continuous moving shot the hand-held camera circles around the performer’s body and approaches him. After a cut, a low-angle shot from a static position shows the performer kneeling on the floor. A super-imposed title provides information about the captured performance: “‘Electrical Love Story’ Warpechowski Poland 1979”. Apparently, the images show moments immediately before the performance. On the soundtrack we hear noises — people chatting and walking around — which stem from the visible space. In a medium close-up we see the performer’s head and upper body wrapped up and disfigured by cables. A voice-over by Brisley sets in: “Excitement, fever, alertness, a state of complete ignorance, splendid but fearful time passing up to the moment that I begin.” After a quick zoom-out a medium long shot presents the performer’s whole body wound in cables, he holds a junction box in his left hand, pressing it against his hip. The voice-over continues: “I can still change it, reject it.” The light in the room is switched of and all the visible shapes sink into black. Some flashes from a small light source create indistinct glowing blots in the frame. The following images are in color. Illuminated by a small light source we discern fragments of the performer’s body. We see rather indistinct shapes in a warm reddish light, while the voice-over continues: “I am entering and from this very moment on I am free. Free.” A light bulb is switched on and the performer’s body on all fours begins to take shape. Slow motion shots present extreme close-ups of the performer’s hands fiddling with the cables. On the soundtrack we hear loud noises, which stem from his movements of handling the objects. Due to the slowed-down speed of the images in the film’s postproduction the recorded sounds are distorted and transformed by reverberations. After a brief interjection by the voice-over (“I know I can do everything. Nothing hurts me. I am alone.”), the film’s images are shown in real time. We see the whole body of the performer. He is peeling off the cables and sorting them out. Abstracted through framing, we see parts of the performer’s body singled out in extreme close-ups. The duration and dynamics of his bodily moves are recomposed by means of the images’ slowed-down speed. Abstract visible shapes in red and white become recognizable as a hand, an arm, an elbow, a junction box, and a ball of cables. The following shot presents the performer’s whole body. He raises his left arm, holds a big light bulb above his head and freezes in this pose. On the soundtrack the voice states: “The end. A feeling of exhaustion and happiness. Afterwards I begin to define what has happened. It is only partly the result of my participation.” After a prolonged superimposition a shot presents the performer from a greater distance. He stands in front of a wall turning his back to the camera. The light bulb hangs on a cable from the ceiling of the room and swings from left to right in the middle ground of the image. The moving light source creates a huge shadow of the body, which wanders across the rear wall. Accompanying these images we hear abstract electronic sounds and the voice-over: “I have experienced it 80 times, moments of happiness on the brink of despair. When I think about it, I am afraid, but I know that on a certain day, in a certain place, at a certain time, I’ll be ready.” The following shots present the enormous, slow-moving shadow. The dynamics of the unsteady spreading of light and shadow in the image are reinforced by quickly pulsating moves of the camera, with recurrent zooms-in and zooms-out. This montage sequence of Being and Doing juxtaposes the views of the performer’s body from varying distances with the audible voice, which evokes an intimate proximity to the sound’s source and unfolds an introspective description from a performer’s point of view, using the pronoun “I.” Further, the shifting perceptions of the images’ color, the abstraction through framing, and the texture of the film grain conflict with the viewers’ attempts to distinguish and understand the mutable visible shapes. Apparently, the camera crew did not use extra lighting for recording Warpechowski’s work. Thus, the performer’s play with light and shadow is the limited resource for forming the film’s imagery. The dark and blurred images demonstrate strong indexical ties to the real space of the performance’s production and the coextensive event of shooting the film. The visual documentation of Warpechowski’s performance composes images from different camera positions and angles and displays details in extreme close-ups. By reworking the footage in an optical printer the filmmakers created color effects, fade-outs, and titles. In addition, the filmmakers reorganized the rhythm and pace of the footage through copying procedures. By multiplying particular frames through printing the visible gestures’ real duration is slowed down and the existing images’ progressive changes are recomposed in the film’s temporal structure. Rather than presenting the images as truthful real-time recordings, the abstraction of visual shapes through framing and printing overtly demonstrate the apparatus-based images’ reworking of time. These comments demonstrate that the aesthetic experience and critical evaluation of the film strongly depend on the referential framework of the viewers’ contemporary visual culture and its mass media images and technologies. Film documentations of artists’ performances not only allow the captured live art works to be preserved, revisited, and reevaluated. Moving through and across time the film documentations themselves are subject to changing responses and differing understandings and conclusions. For today’s viewers the film’s grainy texture does not evoke news programs or factual media. Rather, the imagery supports the viewers’ self-aware sense of the time that has passed since the film was made. In contrast to the contemporaneous evaluations of the film form, today’s viewers might judge the formal choices and practices of documenting differently. The former strong connection to the look of newsreels has faded and this enables the specific aesthetics of Being and Doing to be relocated and reviewed in the tradition of structural materialist film practices. The framed views of artists’ performances in Being and Doing do not operate like transparent windows on the unfolding events. Rather, the film form overtly demonstrates the structuring intervention of the film medium’s techniques in recording and representing the performance works. This is most effectively achieved by foregrounding the frame as a temporal and spatial unit and as the essential constituent of film. The filmmakers’ preoccupation with framing, the duration of the take, and the filmstrip as the images’ material support accentuates film’s capacity to reveal its own physical history in the time-based event of projection. In order to reinforce the images’ credibility and their linkage to the now and here of actual events, Le Grice advocates “to develop language and techniques which can clarify, within the film’s structure, the actual processes which are taking place.” (Le Grice (1972) 2001, p. 156) In his discussion of the ways in which the film form might scrutinize and reveal the various stages of the production process Le Grice states his strong interest in printing in his own practice as a filmmaker. For Le Grice printing “allows physical aspects of the medium, the reality of the celluloid, emulsion, sprockets, the nature and capabilities of the machinery to become the basis of experience and content.” (Le Grice (1972) 2001, p. 156) Although the foregrounding of film’s materiality and of the mechanical and chemical processes cannot completely avoid the retrospective and referential relationship between the presented reality and the viewers, Le Grice claims that the exploration of filmic materiality diminishes the narrative, theatrical, illustrative, or representational workings of film’s moving images. In short, Le Grice considers copying procedures and the structuring of film’s recorded images through printing as practices, which support the viewers’ awareness of the concrete referential situation within the unfolding time and duration of the projection event. My discussion of Being and Doing focused on the materiality and the compositional temporal forms of the film’s images. The film form foregrounds the time-based structures and the time-bound experiences of performance events and of the related practices and processes of documentation. With regard to the interplay of embodied acts and acts of documenting, which rely on technological procedures, I commented on three different approaches to forming images of artists’ performances: the photographic intervention in the performance situation in Moments of Decision/ Indecision, the visual abstraction and temporal layering through framing and montage in Being and Doing, and the film’s transformation of the color, pace, and rhythm of recorded images through printing. As the example of Being and Doing shows, performance documentations always emerge from an encounter and negotiation between specific creative practices, which introduce particular concepts of process and collaboration, materiality and duration, embodied relations and aesthetic experiences. In Being and Doing the tangled relationship between images of physical activities and the experimental film practice support a material experience of time and duration for the viewers: the filmic images emerge as objects and as time-based acts. Stuart Brisley Moments of Decision/Indecision, Teatr Galery, Pałac Kultury i Nauki, Warsaw, 1975. Brisley reports on the production process of this durational performance and on his collaboration with Haslam in an interview conducted by Nick Kaye, see Kaye 1996. A performance protocol written by Brisley is included in a review of the performance: Chaimowicz 1976. Philippe Dubois adopts and specifies the notion of “photographic act” (l’acte photographique) from French photographer Denis Roche in order to highlight the constitutive entanglement of the picture and the pragmatic acts, which produce the picture (like the acts of taking, beholding, distributing, theorizing the photograph etc.). Cf. Dubois 1990, pp. 9–10. According to Dubois, photographs are pictures and acts at the same time: they show something and they demonstrate that they are iconic proceedings. In his reflections on photographs Roland Barthes repeatedly refers to the beholder’s feeling of amazement, which is caused by the impression of something that is past and real at the same time. Cf. Barthes 2010, pp. 82–84. Eleonora Fabião has emphasized the capacity of incomplete and fragmentary records of performance art to create new relational meanings: “Fragments challenge totalitarian orders; they resist unification and linearity by affirming themselves as open force fields that attract and repel other fragments composing mobile systems of relational meaning. … In its associative performance, the fragment activates multiple circuits of references in unpredictable ways.” Fabião 2012, p. 131. The film is available at: http://vimeo.com/51508286, February 4, 2016. Full Credits are available at: http://artsonfilm.wmin.ac.uk/films.php?a=view&recid=142, February 4, 2016. Obviously, when the film was made photographs and film clips of the political and economic situation in Poland were widely featured in newspapers and television news programs. Thus viewers at the time were familiar with the images. Voice-over by Stuart Brisley, Being and Doing, 00:10:50. A full transcript of the film’s spoken texts is available at Stuart Brisley’s website: http://www.stuartbrisley.com/pages/40/80s/Text/Transcript_of_film_text:_Being_and_Doing,_a_film_by_Stuart_Brisley_and_Ken_McMullen/page:4, February 4, 2016. Warpechowski pierced his hand on a nail in several performances that he carried out in Poland. The British witness’s account, which we hear in Being and Doing, might refer to the performance Agreement, that Warpechowski presented as part of an English–Polish performance art program at the Oval House in London in 1981. Later Warpechowski also included this action in a series of performances that he presented under the title 10 Performances in 2 days at the Documenta VIII, in Kassel in 1987. Cf. Hunter/ Bodor 2012. Voice-over, Being and Doing, 00:11:43. This quotation and the following quotations are taken from the voice-over, Being and Doing, 00:16:20–00:20:21. The optical printing work for Being and Doing was done by Kim Nygaard, Horatio Monteverde, and Peter Savage. Ken McMullen, https://kenmcmullenfilms.wordpress.com/short-films-index/beinganddoing, February 4, 2016. For further discussion of the notion “structural/ materialist film,” introduced and polemically debated since the early 1970s, see Gidal 1974; Le Grice (original edition 1972) 2001; Le Grice (original edition 1978) 2001; Wollen 1982. Barthes, Roland: Camera Lucida: Reflections on Photography. Transl. Richard Howard. New York 2010, pp. 82–84. Berkus, Gunther: Performance Art Now. In: Circa Art Magazine, 24 1985. Brisley, Stuart: The Photographer and the Performer. In: Alice Maude-Roxby (ed. ): Live Art on Camera: Performance and Photography. Southampton 2007. Chaimowicz, Marc: Performance. In: Studio International: Journal of Modern Art, 191 1976, p. 66. Dubois, Philippe: L’Acte photographique et autres essais. Paris 1990, pp. 9–10. Fabião, Eleonora: History and Precariousness: In Search of a Performative Historiography. In: Amelia Jones/ Adrian Heathfield (eds. ): Perform, Repeat, Record: Live Art in History. Bristol 2012. Gidal, Peter: Definition and Theory of the Current Avant Garde: Materialist/Structural Film. In: Studio International: International Journal of Modern Art, 187 1974, pp. 53–56. Hunter, Rody/ Bodor Judit: Art, Meeting, and Encounter: The Art of Action in Great Britain. In: Deirdre Heddon/ Jennie Klein (eds. ): Histories and Practices of Live Art. Houndmills/ Basingstoke 2012, pp. 85–87. Kaye, Nick: Stuart Brisley. In: Nick Kaye (ed. ): Art into Theatre: Performance Interviews and Documents. London 1996, pp. 76–78. Le Grice, Malcolm: Material, Materiality, Materialism (original edition 1978) In: Experimental Cinema in the Digital Age. London 2001, pp. 164–171. Le Grice, Malcolm: Real TIME/SPACE (original edition 1972). In: Experimental Cinema in the Digital Age. London 2001, pp. 155–163. Wollen, Peter: ‘Ontology’ and ‘Materialism’ in Film (original edition 1976. In: Readings and Writings: Semiotic Counter-strategies. London 1982, pp. 189–207.